Kansai is a region that stems from the metropolis of Osaka and spreads out to the the prefectures of Nara, Kyoto, Kobe, Wakayama and more. I’d missed the area and it’s people since my last visit a year prior. The following photographs were taken over a week on the turn of 2014. 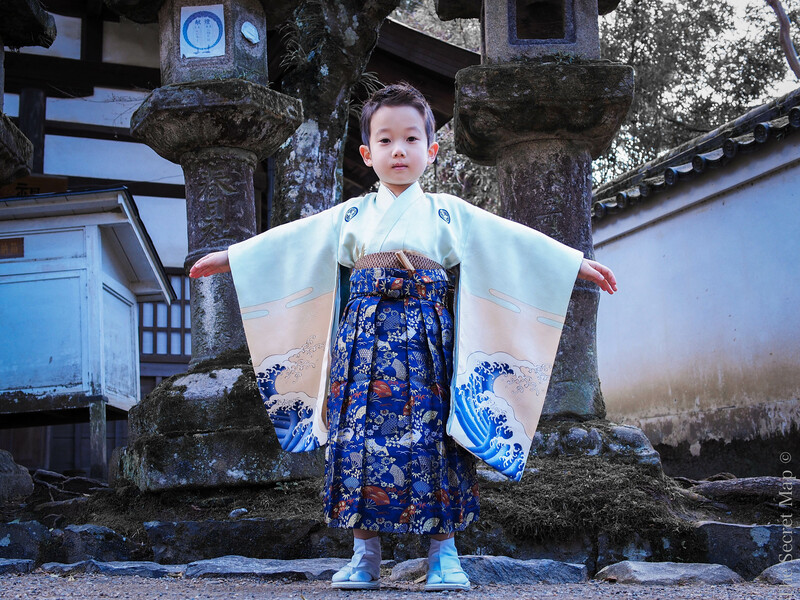 To begin the trip, it was impossible not to return to Nara, Japan’s ancient capital. It was New Year when I saw this boy was with his family. 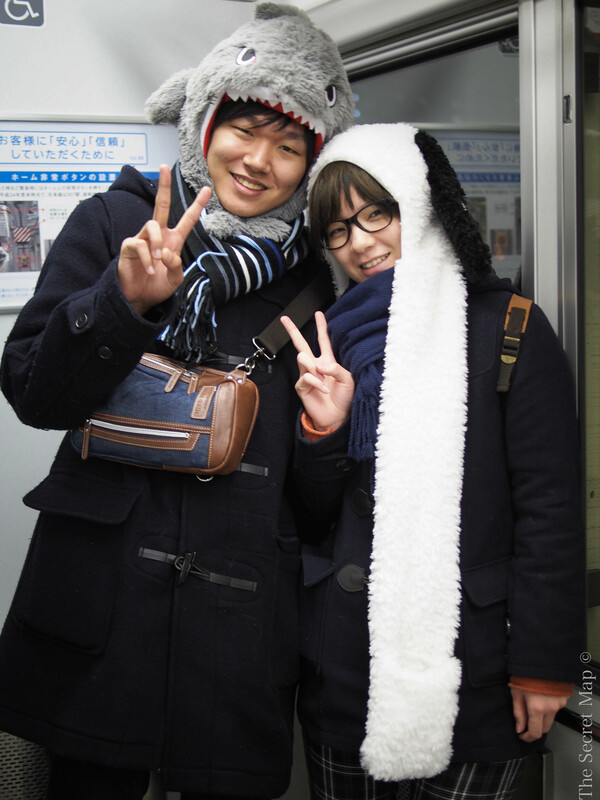 His father, originally from Nara, had bought them on vacation from Tokyo to his former hometown. After walking past them and doing a double take, I immediately backtracked to chase this young master down. 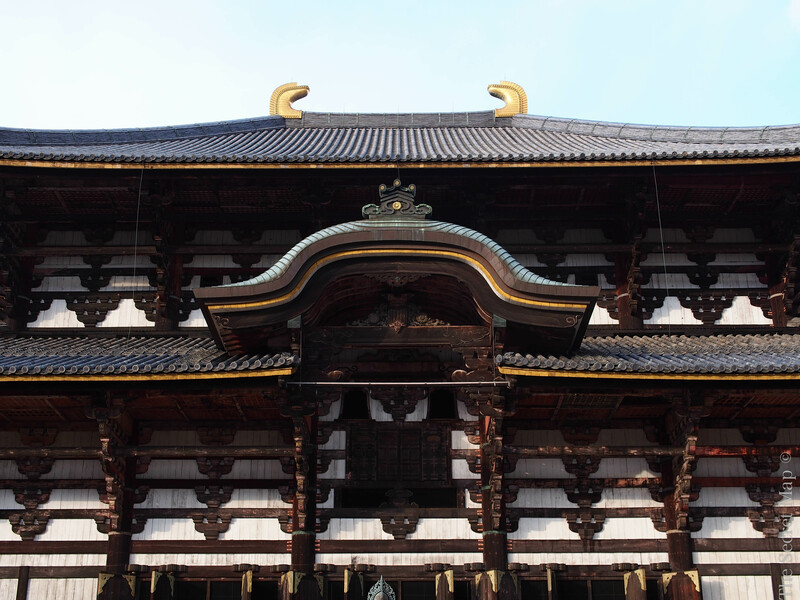 Todai-ji, the biggest wooden building in the world, housing the world’s largest bronze buddha, is one of seven UNESCO World Heritage listed buildings in Nara. This gargantuan structure was a humbling sight even on a repeat visit. 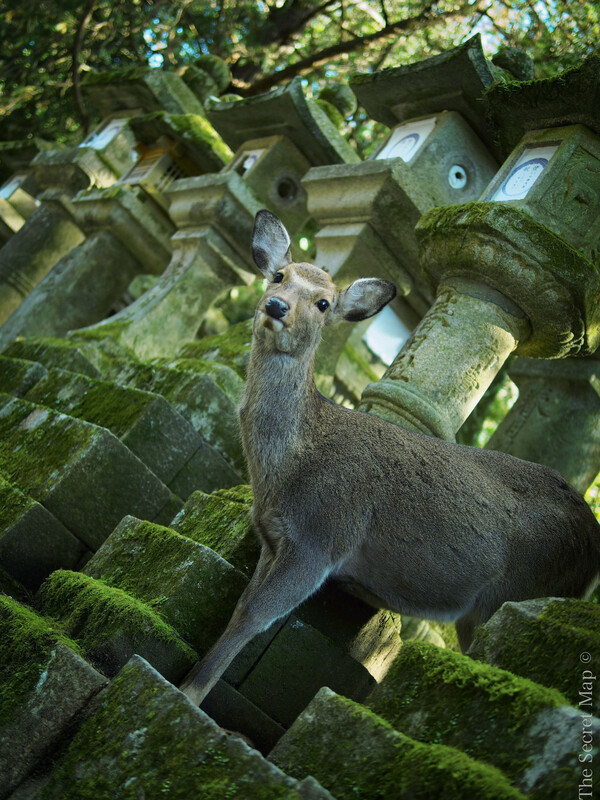 The Sika deer that roam freely in Nara are thought to be messengers of the Shinto gods. The vast amount of them combined with their friendly nature as they intertwined with the mossy surroundings makes exploring Nara a uniquely enchanting experience. 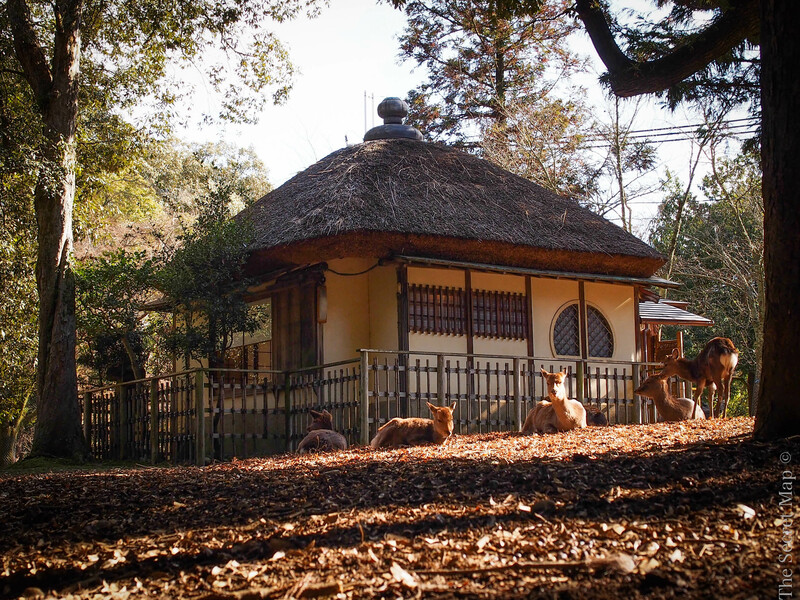 Nara Deer Park contains many quaint thatched roof houses. The Legend of Zelda music automatically plays in my head as I stroll through these parts. Nara’s ‘primeval forest’ is truly otherworldly. It’s no wonder the Japanese have created such imaginative works of fiction when you can wander into the woods and see the such fantastical natural developments like this twisted old tree. 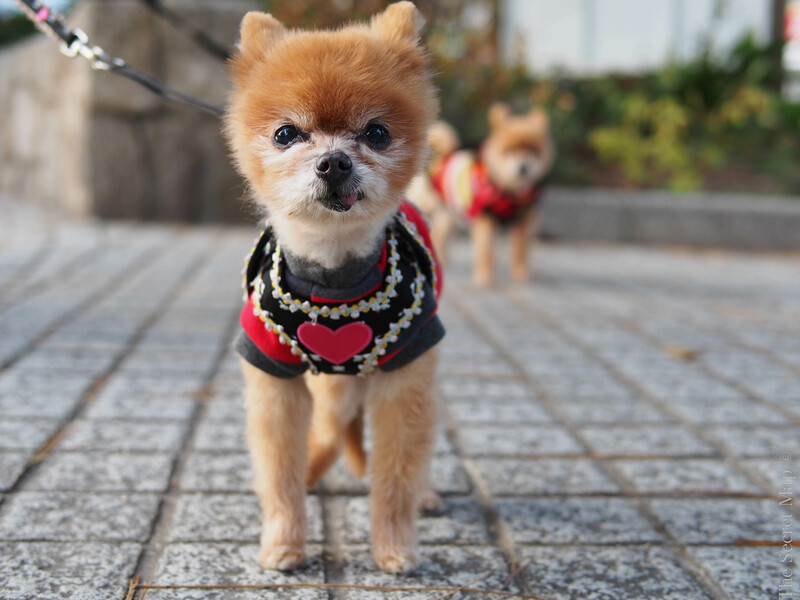 On the streets of Hyogo, Kobe, Japan’s biggest sake producing area, I came across these Pomeranians. Living, breathing, teddy bears. East Asia loves their toy dogs. You know you want one. 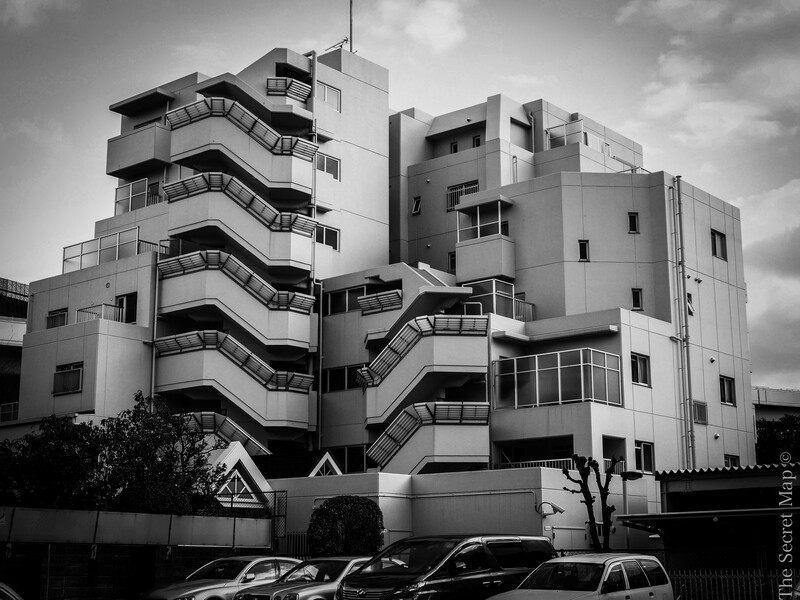 I love the cuboid designs of modern Japanese architecture like the one above. It’s like being inside a Nintendo game when walking the streets in Japan. 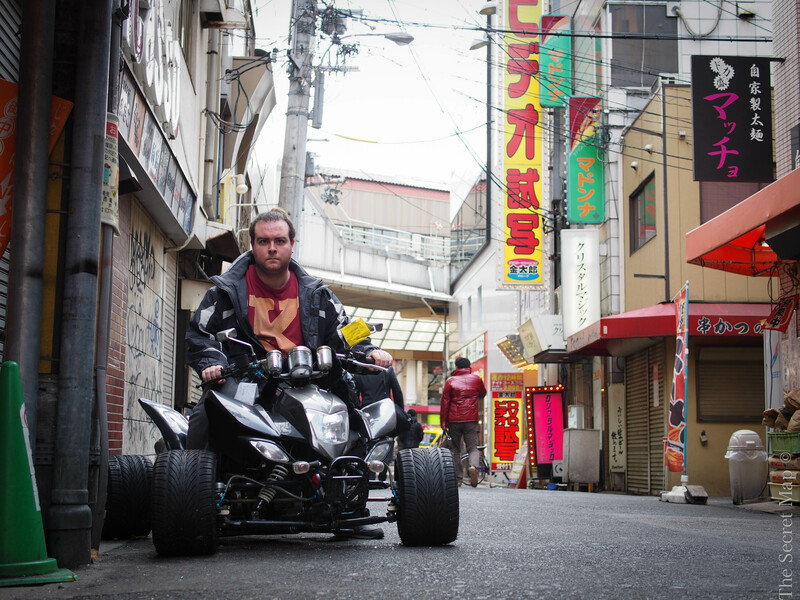 We found these wheels down an alley in Kobe city center. It’d been ticketed and clamped. Definitely not street legal but nonetheless legit. There’s so much wealth on display in Kobe – a surprisingly beautiful city for it’s lack of international attention that contains an array of exquisitely well-preserved colonial European architecture. 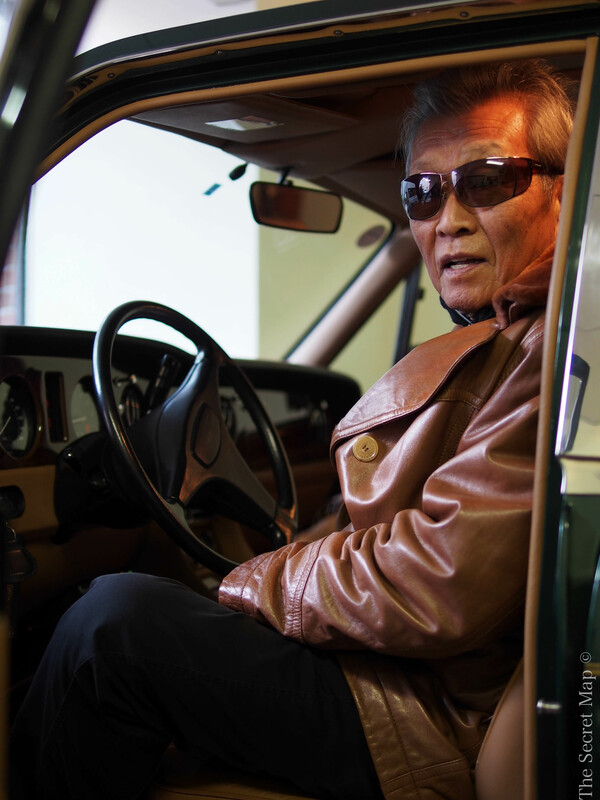 This resident was about to take his Bentley for a spin. 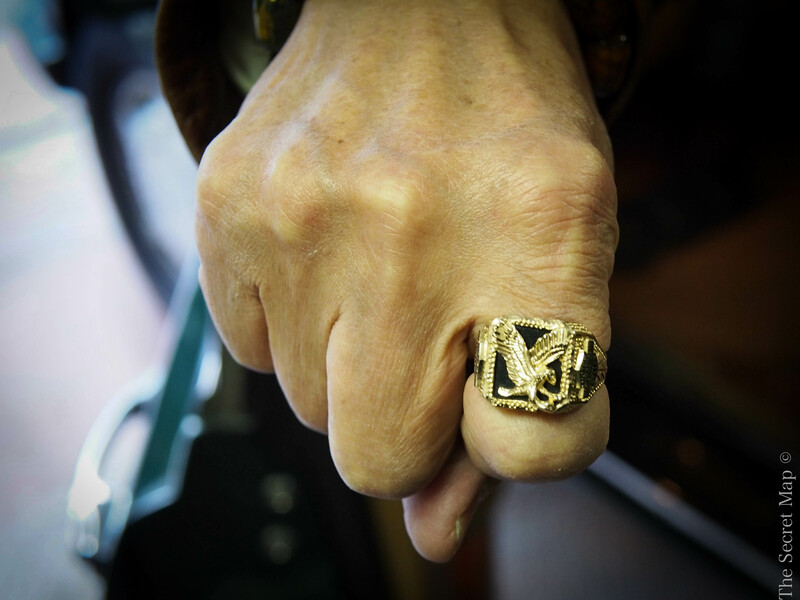 Before taking off, he showed us what kind of bike he rode when he fancies two wheels by proudly displaying his midlife crisis ring. 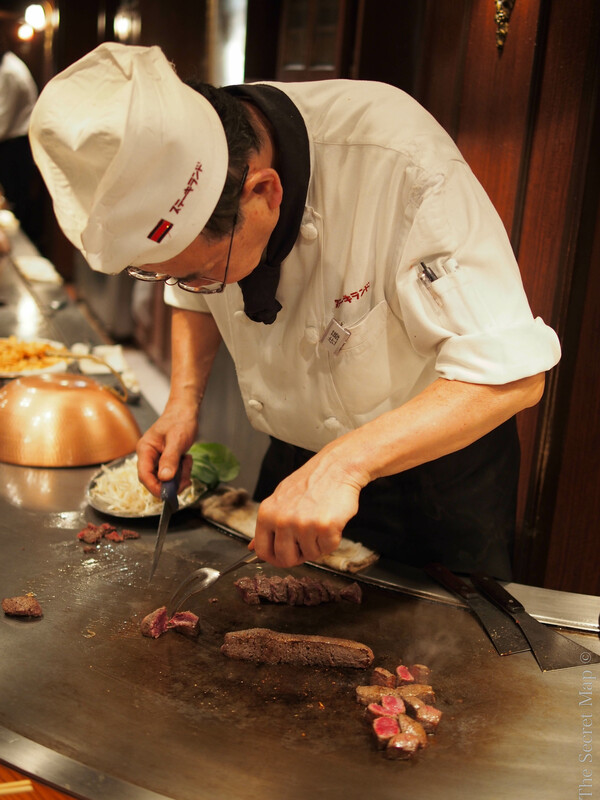 The chef above is cutting up ‘Kobe Beef’, the local speciality made from cows that are massaged with sake and fed beer. It’s this luxurious treatment of livestock that ensures the very cheapest price you will find in town for a strip as thin as the one he is cutting up is 30 dollars. 100 bucks a steak is standard. Perhaps it’s the reds in the image, but you just know grandma here had her fill of red meat at the same restaurant. Kobe’s Chinatown is a food extravaganza. 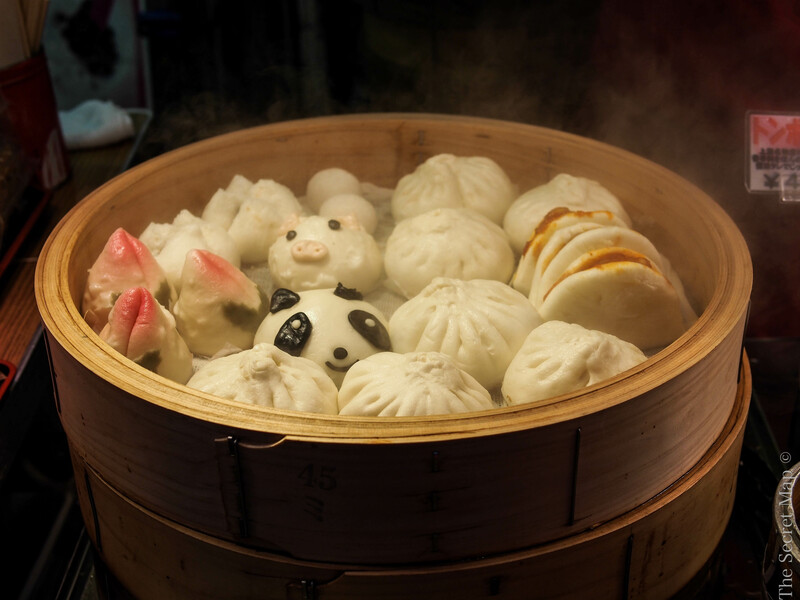 The most notable of what was on display were these ‘We’re too cute to eat’ dumplings. 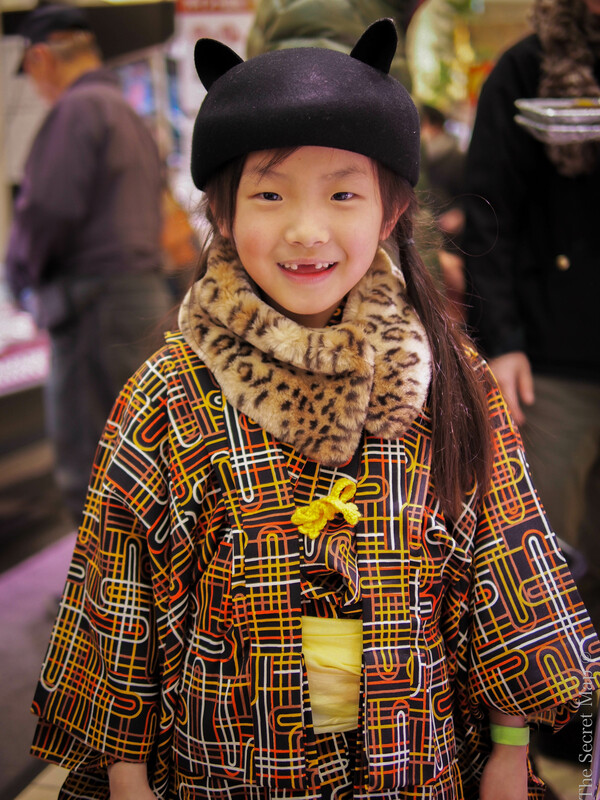 One of my favorite pictures from this trip is of the girl above, who was with her family on New Years Eve shopping for fresh fish dinners at a supermarket in Kobe. Adorably, she stopped and waved with that amazing smile whenever I passed her in the aisles afterward. 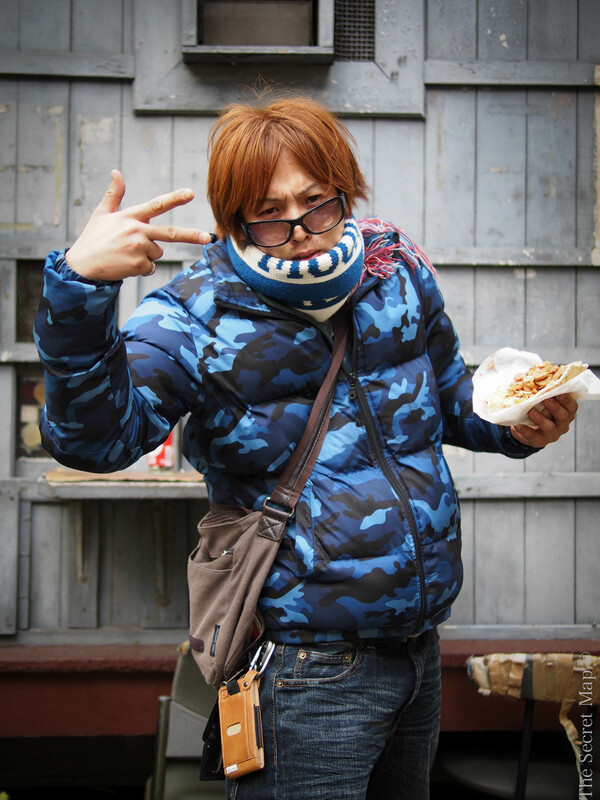 Back in Osaka for New Years Day, those fried tentacles aren’t going to sell themselves. Octopus balls, known as Takoyaki, are delicious. The Shinsekai neighborhood of Southern Osaka has Takoyaki restaurants in abundance. On my second visit to this sushi restaurant in as many days. I was slightly overwhelmed that they’d all remembered my name. “Simon, Simon!” they shouted upon my entrance. As I took a seat, once again, as if to confirm they had it right, they asked “Simon?” – to which I gave a pleasingly ‘local cred’ nod. Taking off my jacket and rolling up my sleeves, I looked up to notice a plate had already been served. I threw a glance to the chef. “Salmon!”, he said with a knowing smile on his face. Getting lost in translation never tasted so good. 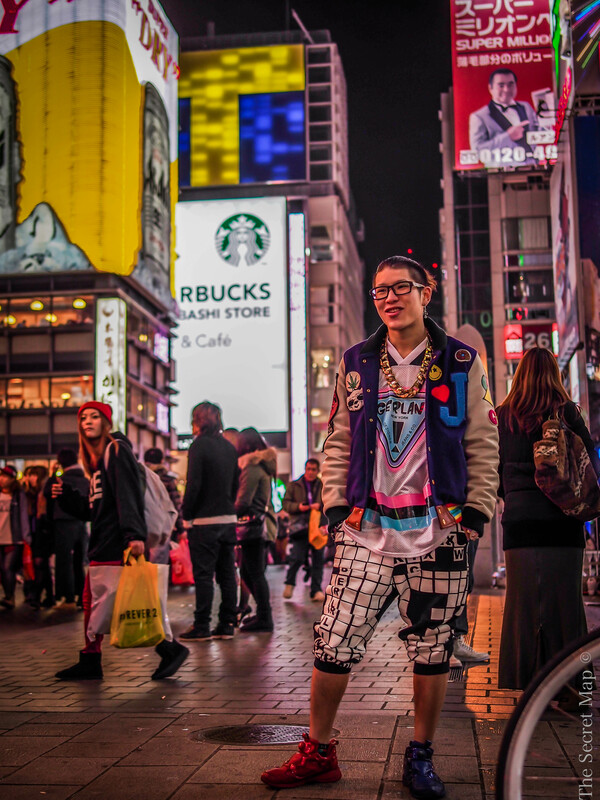 Osaka’s residents are thought to be much more open and spontaneously welcoming than their Tokyo counterparts – the latinos of Japan, so to speak. This guy jumped off his bike, kebab in hand, and immediately started chatting away. In fact, he was so hyper-vocal and excited that before he knew it i’d taken him off to the side to strike a pose. He didn’t seem to have any social barriers whatsoever, as if he’d stumbled upon us in the early hours of a festival. I love the Japanese spirit. This was the first photo I made on the trip, at the center of Shinsekai in Osaka. It’s a vibrant area that wouldn’t be out of place as the Japan setting in a Street Fighter game. The boy above had just put a penny in the cup of a man dressed as Miyazaki’s Porco Rosso. From a frozen position, he’d moved into a handshaking posture once the boy dropped a coin in, then didn’t let go of his grasp. I waited just a minute by the colorful shutters above to snap someone who looked interesting. This guy was more than obliging to be a temporary model and fit in with the background colours. With his mustache, bright clothes and optimistic glint in his eyes, he himself could be a Miyazaki creation. 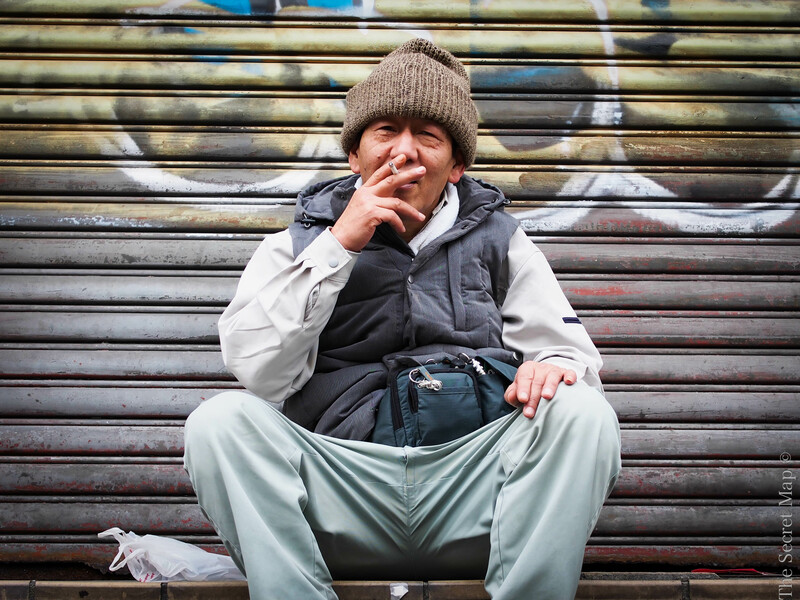 In contrast, the man above, although friendly and open to being photographed, was more representative of the older generation that linger in the unseen parts of Shinsekai, beyond the boutique shops and kitsch restaurants. 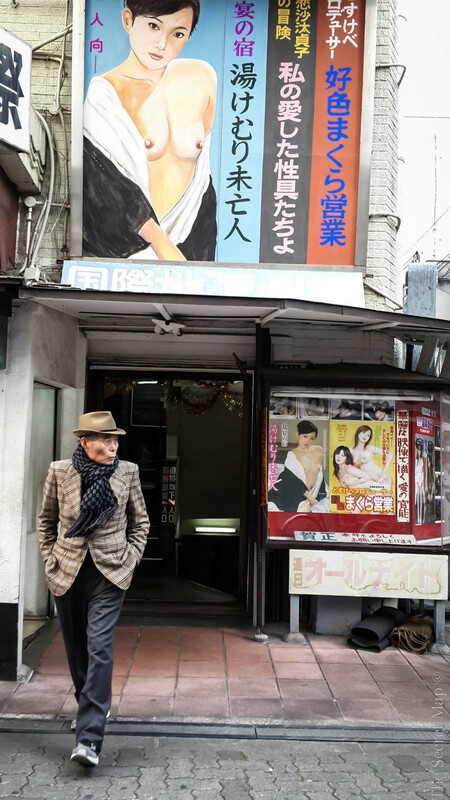 There are a lot of elderly men in these parts loitering, drinking, smoking and spending their days between the sidewalk, pachinko parlors, karaoke bars and alcohol vending machines. With Japan’s negative growth rate and increasingly expanding pensioner population, this is going to be an even more common sight in the future. It was early afternoon on New Years Day, I didn’t have to wait long here to capture the first customer. I call this ‘The Casual Exit’ – it would have been the perfect crime had I not pressed a button on my phone that immortalizes him forever on the internet. Let’s hope his grandchildren don’t see this. 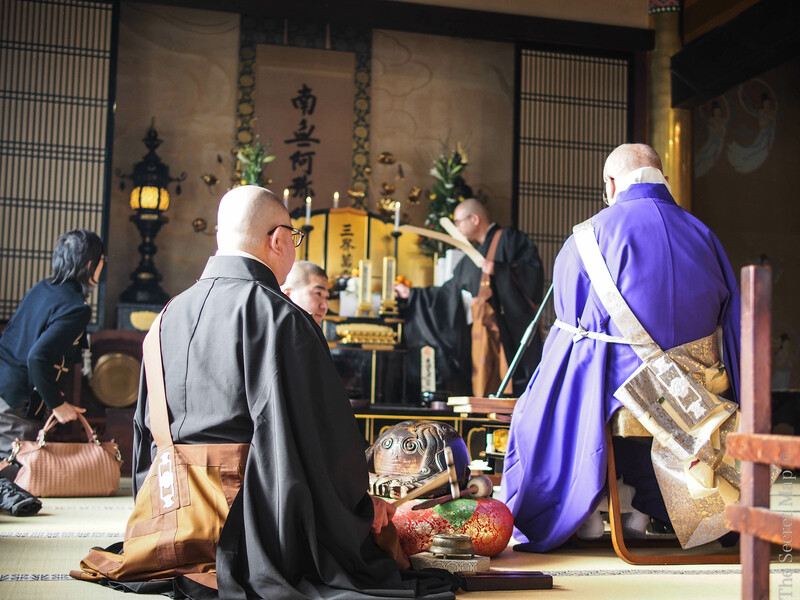 Where better to cleanse the soul than a New Year’s temple chanting. I hope the otherwise distinguished gentleman previously mentioned took himself to Shinsekai’s local temple, and one of Osaka’s most famous, Shitenno-ji, after his morning digression. Not far from Shitenno-ji is a row of temple-bearing cemeteries multifarious in design yet uniformly beautiful. Chopped bamboo shoots line the entrance to the wooden slat doors above, overseen by Totoro. Nipponbashi, aka ‘Den Den Town’, is a haven for geeks of games and girls, and increasingly games of girls. 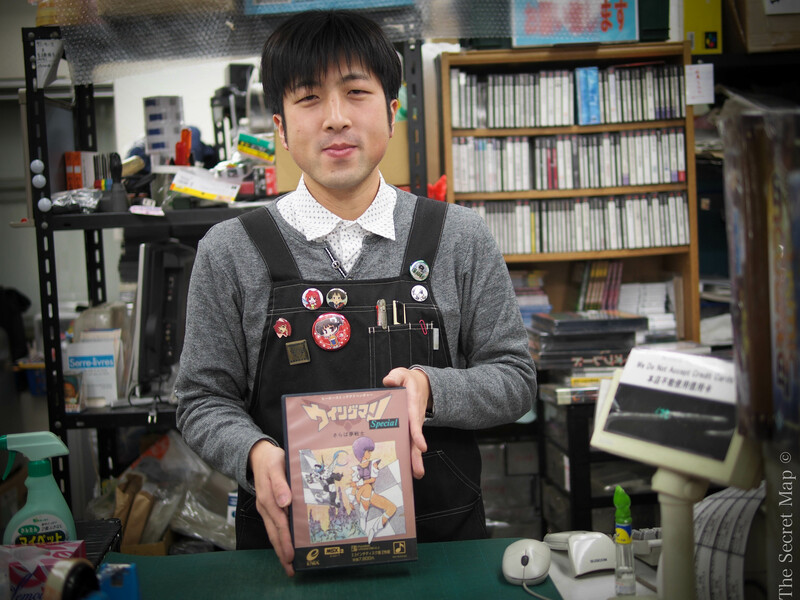 The ‘otaku’, Japanese for ‘geek’, store worker above shows off one of countless relics of video game history in a specialist button basher shop there. The proud kimono wearing couple above were walking through the subway when I approached them, assumedly on their way back from or to a temple to ring in the New Year on January 1st. This elegant girl was on her way back from Kyoto to her parents’ house in Osaka. A native of the city, she was vacationing from Tokyo where she works 12 hour days in a bank just to pay the bills. Her traditional look caught my eye as she stood in front of an ultra-modern trio of girls on a subway billboard. On the subway I saw this couple who were returning from Universal Studios. Their hats were completely outrageous.Where are they going to wear those? Oh, we’re in Japan. 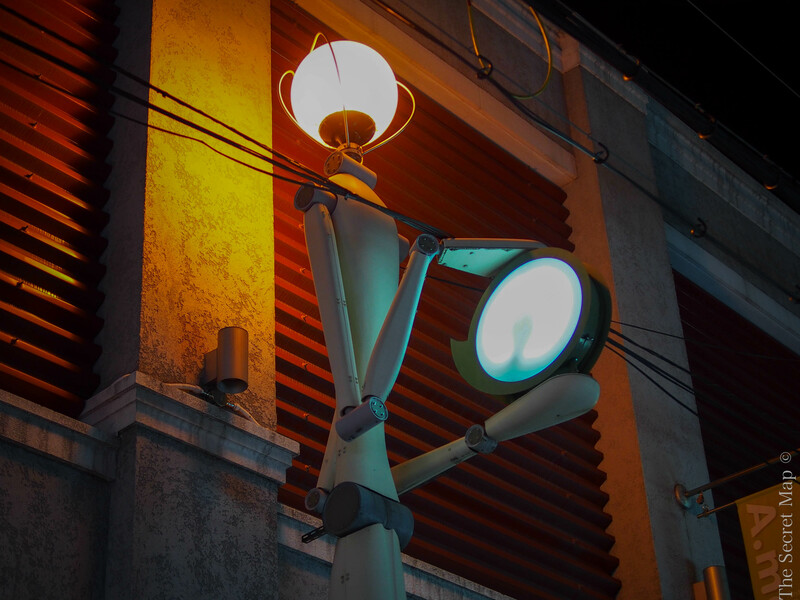 As the night falls on Osaka, it’s science fiction elements begin to shine. 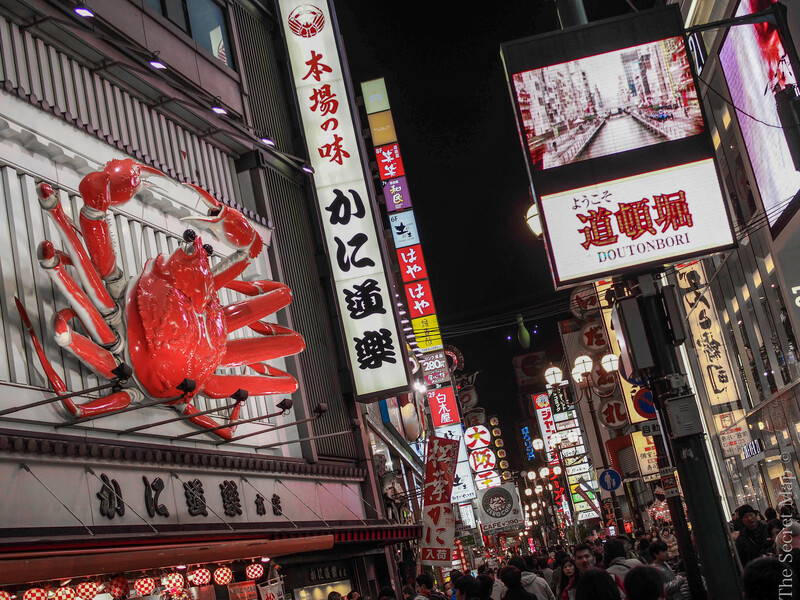 Tokyo has no answer to the sheer velocity of stimuli that is thrown at you in central Osaka, The masses of human traffic shifting through endless neon and giant mechanical crabs, dragons and sushi pieces all battling for attention sends dazzles your senses. It’s maddening. It’s surreal. It’s why you bought that plane ticket. The guy above is a pimp who operates on the bridge by the famous Glico Man. Unlike neighboruding South Korea, where prostitution has been driven indoors, Osaka by night is awash with nefarious activity on the streets. 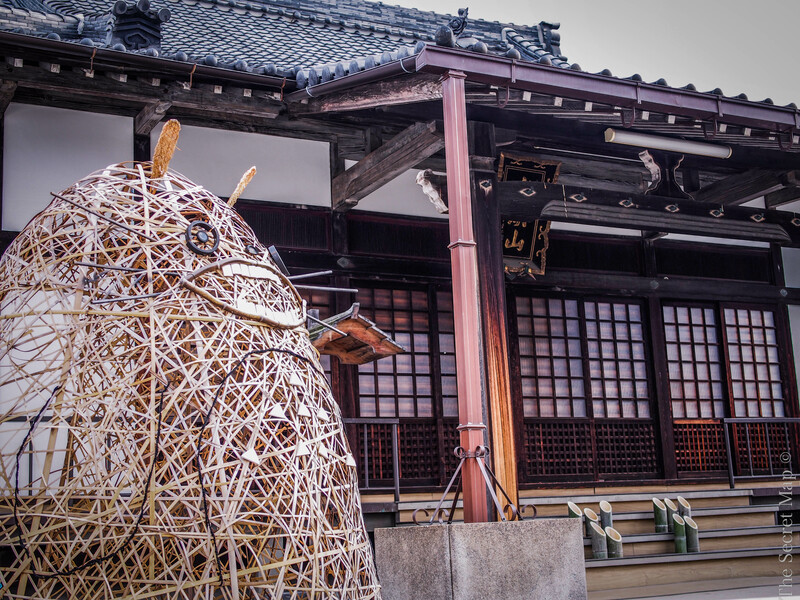 To be able to ride a bike from a lush, mossy, primeval forest to being in one of the most intense sensory urban experiences in the world within an hour is a testament to Japan’s focus on preserving traditions while fostering it’s modern advancements. Japan as a society is not faring well these days. The younger population as well as the overall economy needs growth. Regular natural disasters add convenience to the situation. The spirit of the people, however, is as strong as ever. From what i’ve encountered in my short trips there, it seems there’s no shortage of human energy that made this place what it is today. I can only hope that the country can adapt and recover at the speed needed in these increasingly accelerated modern times. A version of this photo essay was featured at Busan Maps Magazine. For regular updates from The Secret Map, you can follow the Facebook page. Some great pics here. I’m a big fan of “the casual exit”. Thanks Conor. Later his wife was to ask him why he was whistling a tacky jazz tune all day. I feel that I have been there after reading this and looking at the photos.. Amazing that those restaurant guys remembered your name. Love the mossy deer and the gappy smile girl too. Actually they didn’t remember my name – they were shouting “Salmon!” when I walked in, then asked me if I wanted Salmon, because I had been eating purely salmon there the night before. I mistook it for them shouting my name “Simon”. Still, I probably would have ordered it anyway! You have a great eye, leading to some great shots. Well done! 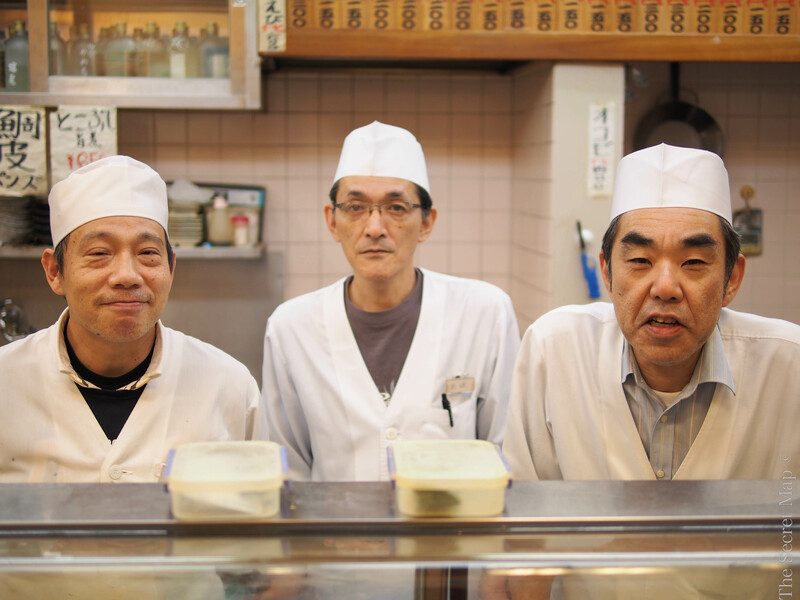 Thanks very much – also the Japanese people were very obliging and friendly to let me take their picture. Your photos are really great, it’s a really good job! I hope to go to Japan sooner or later! Thanks Alessandra, I hope you can go too, I love it there!